Kyrie Irving's new Nike commercial is a charmer. He is playing one-on-one with his dad, Drederick Irving, in the Twitter sequence below. What many of us didn't know was that the elder Irving had the dubious pleasure of playing under the tutelage of Rick Pitino at Boston University and with the Celtics in training camp. His (Kyrie Irving's) father, Drederick, played college basketball at Boston University alongside Shawn Teague and under coach Rick Pitino. After completing his college career, Irving's father moved to Australia to play professionally for the Bulleen Boomers in the SEABL. Irving lived in the Melbourne suburb of Kew before relocating to the United States when he was two years old. He holds dual American and Australian citizenship. His mother, who was half Sioux, died of an illness when he was four, and Drederick raised him with the help of Irving's aunts. So it appears that the senior-Irving's stint under the Evil Emperor, Pitino, at BU did no damage to the Irving lineage. 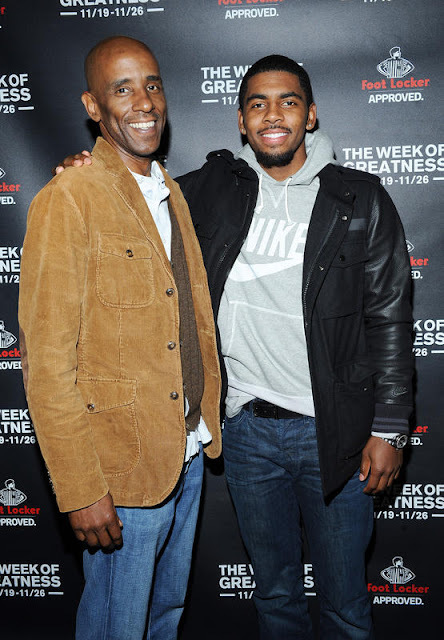 Hopefully, father and son spent a fine Thanksgiving holiday together - despite the fact Kyrie dislikes the holiday but loves the food.